Now they’re targeting the Church. 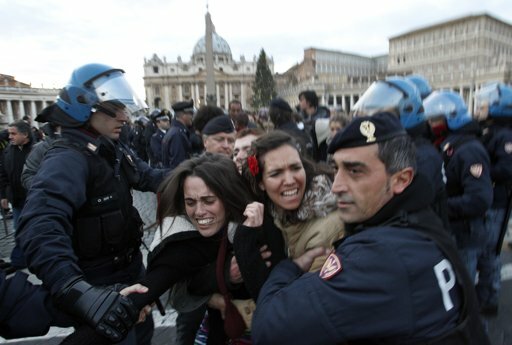 #Occupy goons attempted to set up an encampment at St. Peter’s Square in Rome. Riot police forcibly removed them. Demonstrators attempting to set up a protest camp in St Peter’s Square in Rome have been forcibly removed by riot police backed by the Vatican. Aiming to set up a protest camp similar to the Occupy encampment outside St Paul’s in London, up to 50 protesters arrived in the colonnaded piazza in front of St Peter’s basilica carrying placards calling on the Catholic church to pay more taxes, a likely reference to tax breaks handed to the Vatican by the Italian government. One of the group of protesters, who were mainly French and Spanish, arrived in a pope’s outfit bearing the slogan “indignant heart”, a reference to the Spanish Indignados protest movement. Police moved in when one of the protesters scaled the large Christmas tree standing in the square. Two of the group and one officer were injured in the subsequent scuffle as police in riot gear cleared the demonstrators from the square. Three of the group were detained for identification. At least they didn’t poop in the cathedral this time.